How Many Calories Are in White Bread? The calories in one slice of bread can easily be worked into your daily diet without ruining your calorie goals. But if your meal includes two slices or more -- whether in a sandwich, as toast or served alongside pasta -- white bread is high enough in calories that they can quickly accumulate. 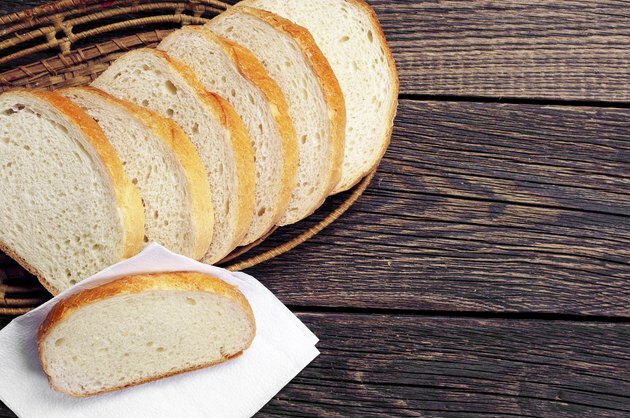 One slice of commercially prepared white bread contains 80 calories, according to the U.S. Department of Agriculture's National Nutrient Database. Homemade bread made using 2 percent milk yields about the same amount of calories, as long as the slice is the same size as typical commercial bread. A thick slice of homemade bread has 120 calories. White bread made from refined flour contains 14.72 grams of total carbohydrates in one slice. This amount of carbs equals 58.88 calories, which is 74 percent of the total calories. A slice of white bread only has 0.8 grams of fiber and 1.52 grams of sugar, so most of the carbs consist of starches. You'll get 2.7 grams of protein and barely 1 gram of fat from a slice of commercially prepared white bread. These values equal 10.8 calories from protein and not quite 9 calories from fat. Homemade bread made from 2 percent milk has about the same amount. Refined white flour is fortified with various vitamins and minerals, including iron and folate. As a result, a slice of white bread is a good source of both nutrients. You'll also get calcium and other B vitamins. Beware that one slice of white bread provides 147 milligrams of sodium, which is about 10 percent of your recommended daily intake.